Inexplicata-The Journal of Hispanic Ufology: Spain: UFOs Over Ria de O Burgo? Spain: A UFO Over Ria de O Burgo? Several witnesses report seeing intermittent lights over the bridge and phoned police to report it. The say that the lights were small, vibrating and flashing. Those who saw them cannot say for sure what they were, where they came from or what their intentions were. They tried to unravel the mystery by phoning the police, but the only unidentified characters the police had any knowledge of were the poachers. The strange flashes were seen a few minutes past noon yesterday. What was most upsetting to those who saw these lights in the sky were their strange, swift movements in different directions, an ability far beyond that of any object known to man. Miquel Pineda was one of those who were left “stunned” by the sight. “The lights were small and over the bridge. Suddenly there were two bright flashes and they vanished into the horizon,” he explained, minutes later. 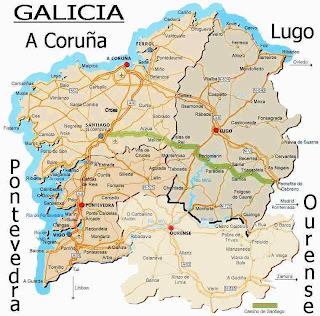 This Catalonian businessman was working in Galicia for a few days and was very frightened by [the sight]. He phoned the police, and at no time did he say that he’d witnessed a UFO, only “something odd.” He asked if there were military maneuvers in the area that could be responsible for such flashes. Ana Segrelles was also petrified at noon when the strange lights caught her attention. “I’ve seen something odd in the ría. They were very strange lights and I’ve no idea what they could be,” she explained, still frightened. She dismissed the possibility that it could be an airplane because they don’t behave in that manner. Nor a helicopter. “It’s blown my mind,” she added.